S 4th Four (adult, 3 juv) Little Ringed Plovers, a Common Sandpiper and 4 Common Terns were present (PW). At least 3 (adult, 2 1cy) Yellow-legged Gulls, 9 Greylag Geese (including a partially white bird) and a Grey Wagtail were present (GE). 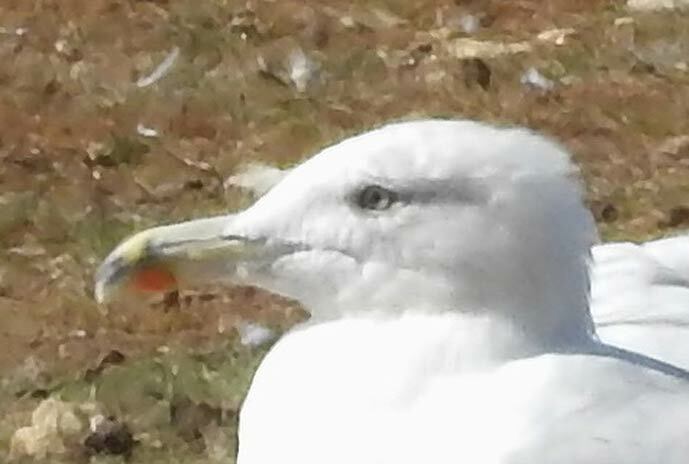 At Stubber's Green there was a 3cy Yellow-legged Gull (GE). 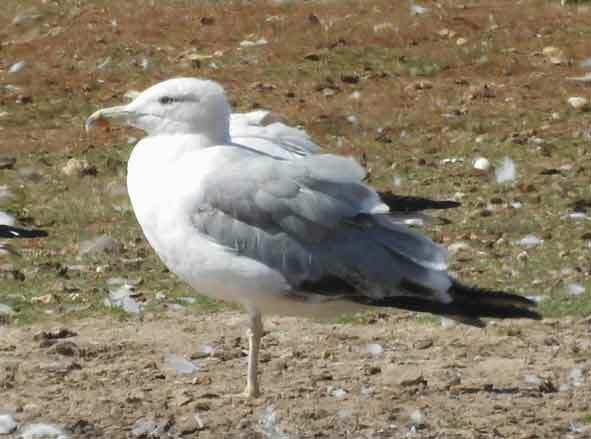 A very similar, perhaps smaller, bird was seen at Upton Warren, Worcestershire on August 14th and identified as a 3cy Caspian Gull - such is the fun of gull identification! 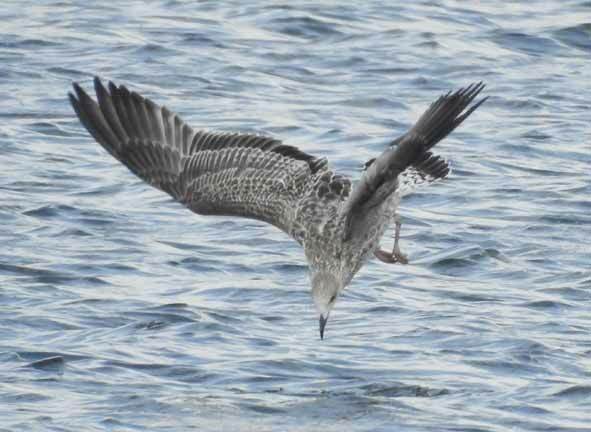 The Upton Warren bird photos show it only on the water so leg length and open wing cannot be seen but bill ratio (2.1) and pale iris tone appear to be identical to the Stubber's Green bird - both features pointing away from Caspian Gull. I aged the bird as an advanced 3cy rather than 4cy due to the strongly marked secondaries and the remaining outer two old primaries having no mirrors which most 3cy and 4cy Caspian and 4cy Yellow-legged Gulls would show. 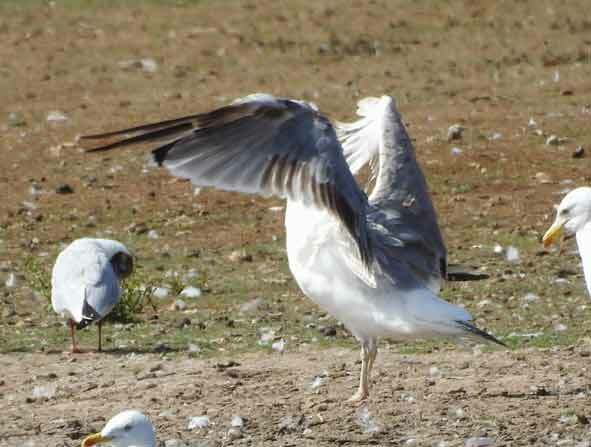 The structure is a good fit for Yellow-legged, as are the shortish, pale yellow-tinged legs and the tone of grey was perhaps within both Yellow-legged and Caspian limits but darker than argenteus Herring Gull though the bright sunlight made it hard to judge. The possibility of it having some hybrid parentage is always there. Opinions are welcomed (GE). 9th The monthly WeBS count produced 63 Mute Swans, 103 Canada Geese, 182 Mallard, 3 Teal, 92 Tufted Ducks, 1 Pochard, 5 Grey Herons, 2 Little Egrets, 1 Cormorant, 20 Great Crested Grebes, 13 Little Grebes, 20 Moorhens, 490 Coot, 23 Lapwings, 1 Dunlin, 3 Common Terns and 2 Yellow-legged Gulls. A juvenile Cuckoo was attracting the attention of a pair of Meadow Pipits on the North Shore, 9 Swifts and 60 House Martins were also present. 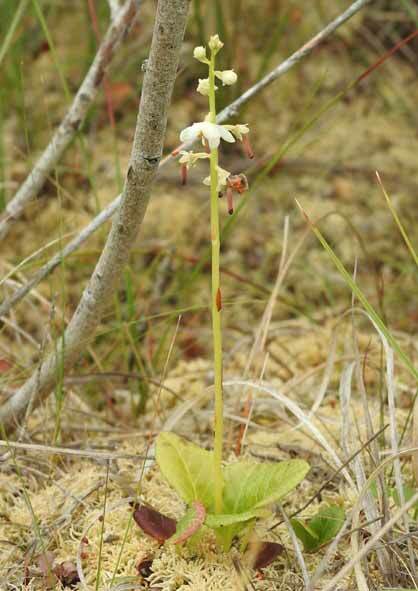 Only 2 Round-leaved Wintergreens were in flower and no Round-leaved Sundews were evident. A Painted Lady and Brown Hawker were also seen (GE). 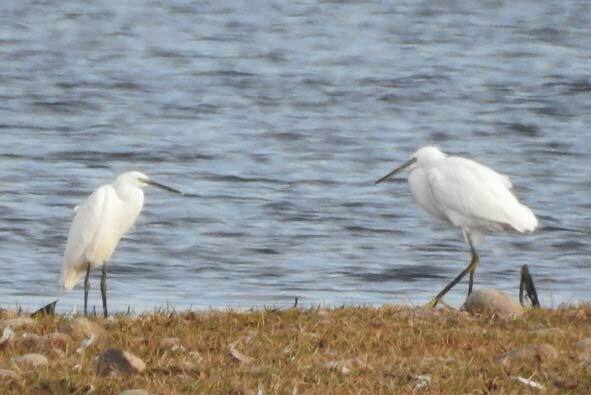 Round-leaved Wintergreen (GE) Little Egrets showing marked size variation; the larger bird also showing yellowish 'knees' (GE). S 11th On Cuckoo Bank there was a Clouded Yellow along with 2 Hobbies and 4 Kestrels (CwS). On No Man's Bank there were 4 Tree Pipits and a Redstart (CwS). 16th 24 Swifts, 200 Sand Martins and several House Martins and Swallows were over the lake during the morning (GE). 21st A Common Sandpiper but no terns were noted (PW. 23rd A Wheatear (JHu), 3 Common Sandpipers and 3 Swifts were noted (PW). 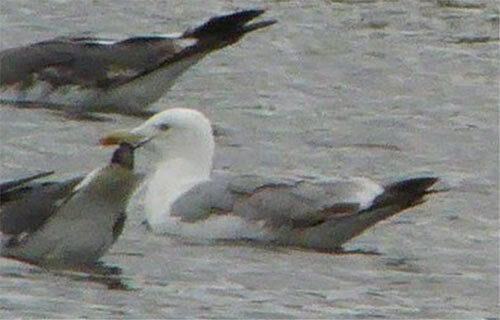 S 25th A 2cy Caspian Gull was bathing in the middle of the lake and a 1cy Mediterranean Gull was off the South Shore. 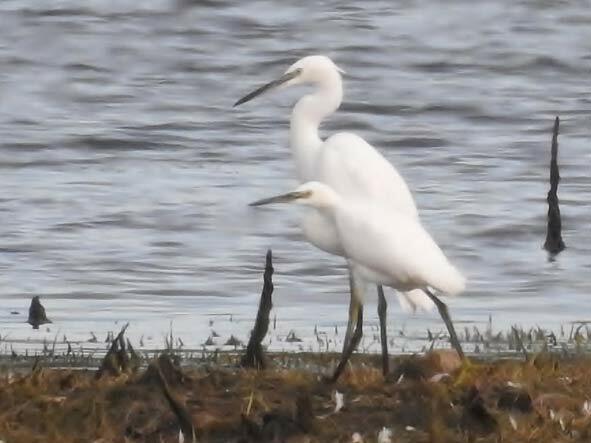 Ten Swifts were over the lake and a Ringed Plover, Little Egret and a Yellow Wagtail were also present (CwS). On Cuckoo Bank there were over 100 Greenfinches and a Corn Bunting (CwS). At Kingswood, near Cannock Tip, there was a Marsh Harrier, a Pied Flycatcher, at least 5 Redstarts, 3 Whinchats and a Tree Pipit flew over (CwS). 29th Three (2 adult, juv) Ringed Plovers and a Common Sandpiper were present (PW).